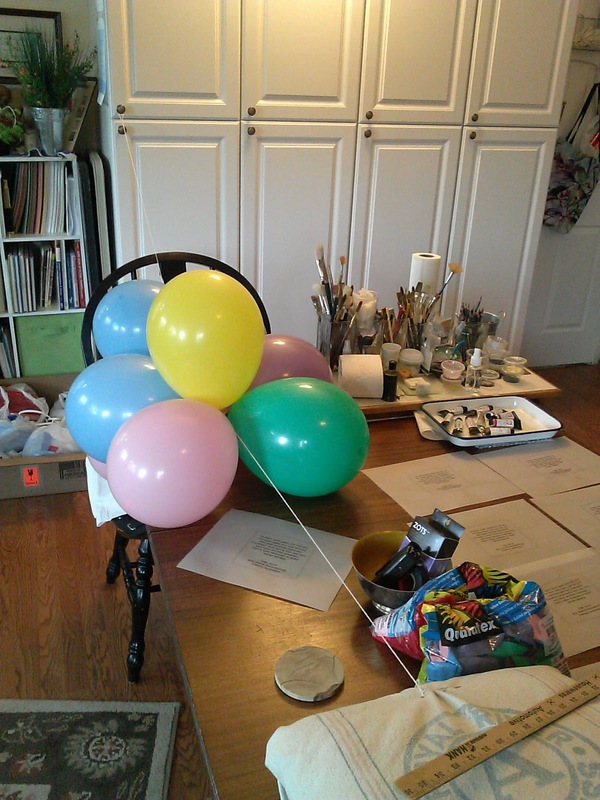 It's my day for writing and preparing to share the week's art studio happenings. As much as I want to keep up with everything, I realize my limitations. I've got a commitment that comes first. My son's eighth grade recognition is next week. It's a big celebration for his class and I'm fortunate enough to help with the decorating team. I've promised my kids that when it comes right down to it, family comes first. This is an event that won't come back around. I love being involved and being available for these milestones. How many balloons make an 18 foot swag anyway? (60) Will a glow stick tucked into a balloon really work? 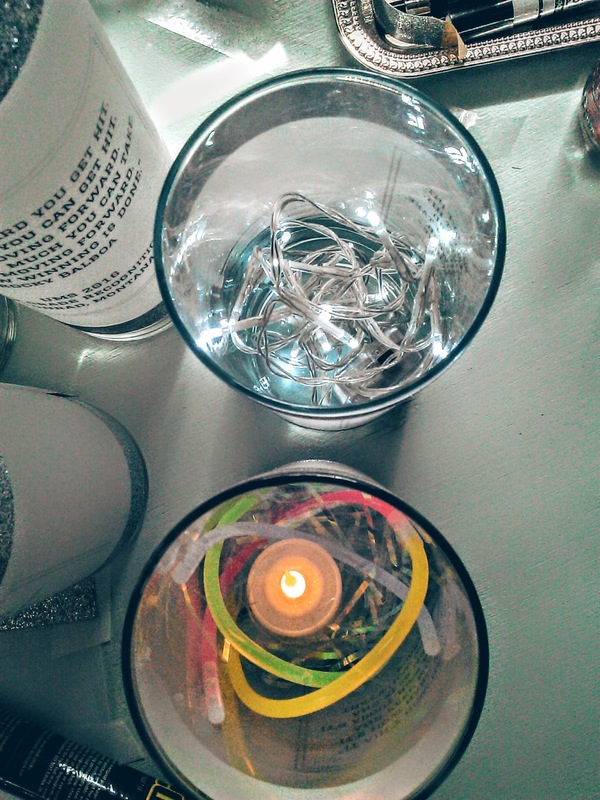 (not really) And so on with so many great Pinterest finds... finding out which clever ideas really work. I've found that the dollar store is the best starting point for any party decor planning. It's difficult to decorate on a budget! Oh, and if you want to sandwich glow stick bracelets between two clear plastic cups, take the glow stick with you to be sure the clear plastic cup will be the right size! Throughout the past year, I've learned that there are times when it's okay to take a break from the art studio. I've been able to establish that routine and it won't be impossible to pick up again soon. So, while I'm not posting a lengthy piece with a great number of photographs today, I am checking in and saying hello! I'm still here, just focusing on glow sticks, balloons, table centerpieces with a Rocky Balboa printed on the vellum wrap, etc. We'll be using red, white, and silver balloons for the party. I had these assorted balloons here at home. I wanted to have an idea of how many balloons would be needed for the desired effect. 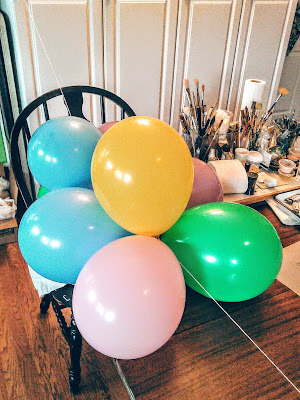 Here's the test run for number of balloons to 3 feet of garland. 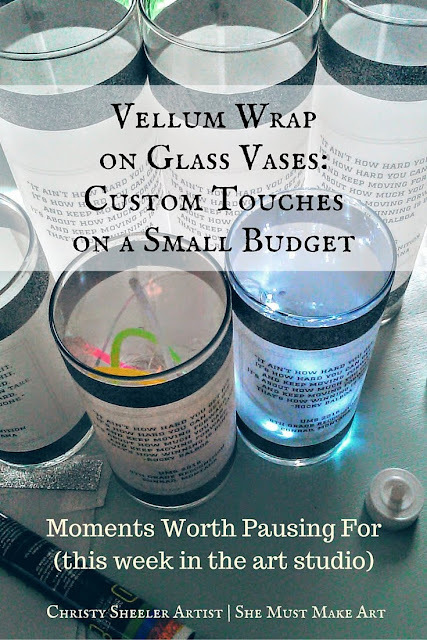 The vellum wrapped vases are my favorite way to make a fantastic eye-catching centerpiece. Here is a snapshot of the supplies I used. Comment below if you have any questions! The vellum is 8 1/2" x 11" sheet and I print on it with my inkjet printer. I set the page format on landscape and centered the text on the page. For the shorter vases, I trimmed an inch from the top and another inch from the bottom, making the sheet 6 1/2" x 11" in size. I printed the class quote on the vellum with the page format in landscape style. 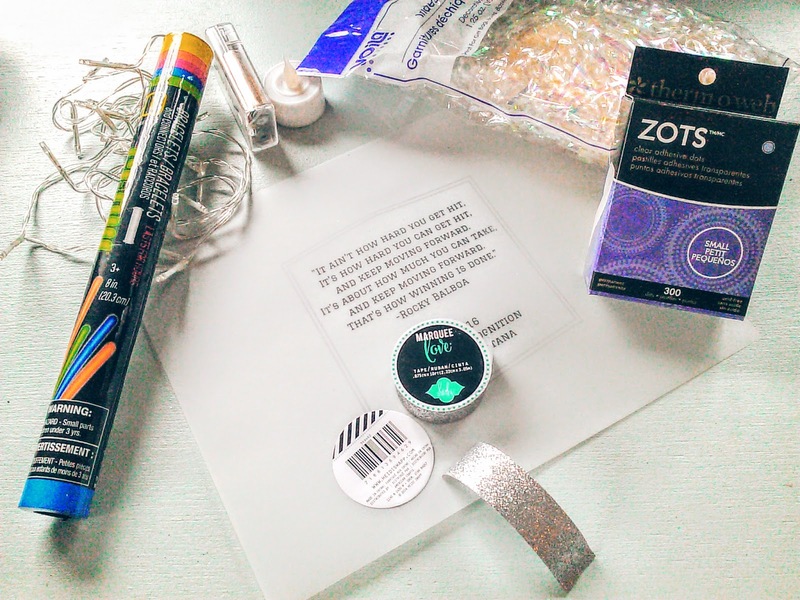 Zots (have you heard of these?) 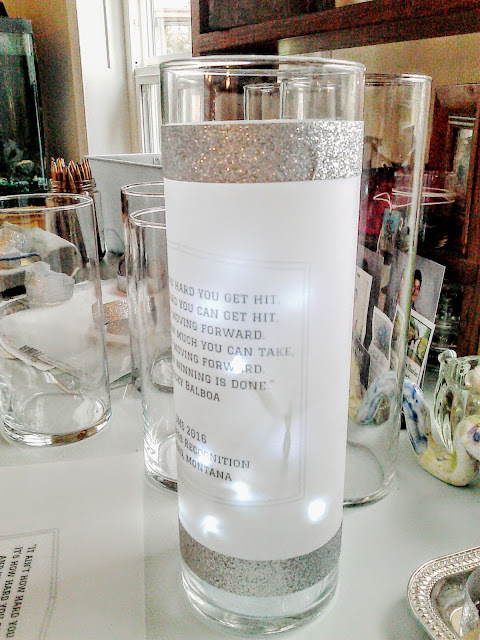 are the most wonderful way of attaching the vellum to the vase. 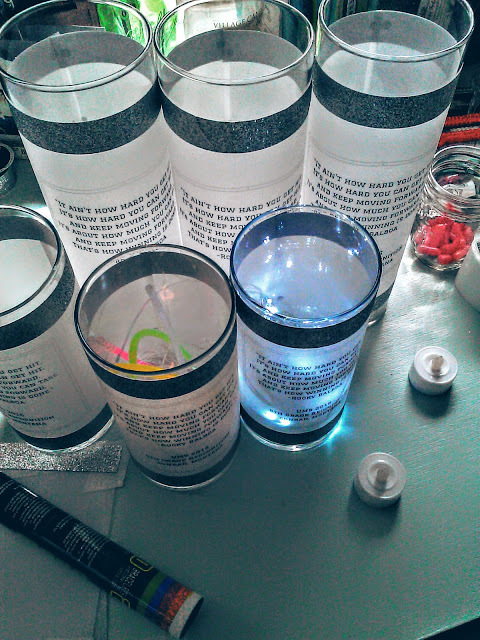 Three little dots of the clear adhesive dots at the left and right edges and the vase is wrapped! That's when I realized I had forgotten a step. The silver glitter tape to trim it needed to be added. The one below was my first try at applying the glitter tape after the vellum was attached to the vase. You can see a wrinkle in the tape and it is unevenly attached. This tape does NOT come back off without some damage to the tape and the vellum. I was better off leaving it for this vase. For the remaining sheets of vellum, I attached the silver glitter tape while the vellum lay flat. If you're curious about making something like this vellum wrap for tall glass vases, I shared the instructions in a December post. See Christmas Tea: Part 2 for more information. For the set I'm working on today, I created them with Canva. It's a very handy online tool for building your own graphics. Wait, what just happened? For not actually planning a blog post, it seems I've got one. It wasn't so hard to complete and hopefully you have a new idea to try! Please feel free to explore the other posts I've shared in the past. Thank you for stopping by and be sure to return again soon! I'll be back in a week...or two. The next week and a half will be busy but I'll be thinking on what to share next time. I want to share posts with quality and purpose. We're going to attempt at least one trip to the mountains so some photography with wildflowers ought to be coming up soon. 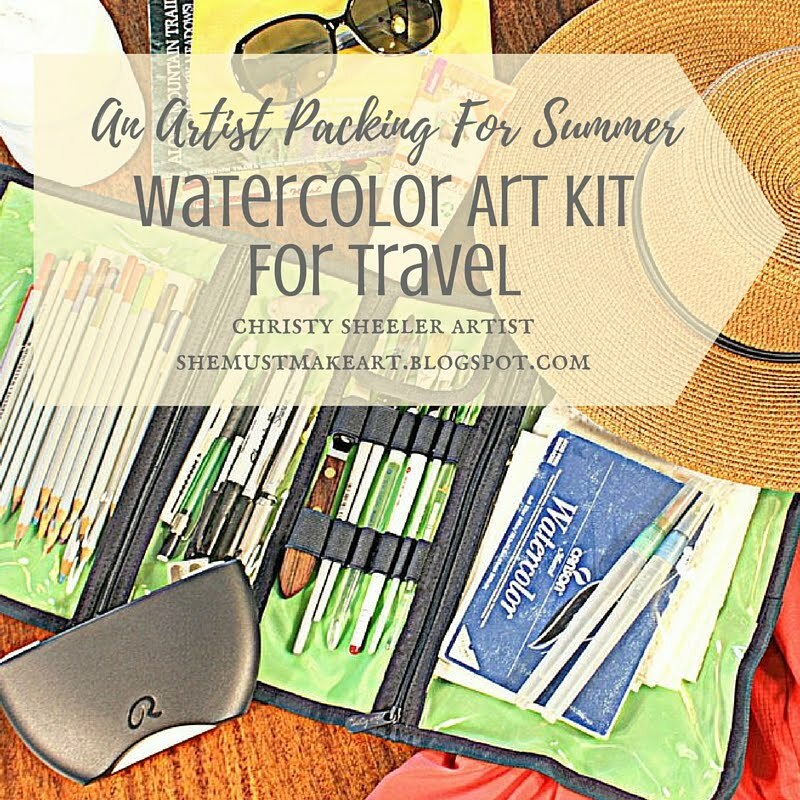 That art travel kit is packed up and ready for our next adventure! I'll do what I can with what I have. I am enjoying this everyday creativity too much to put it down for an extended length of time. What are you making time for? Is there a creative type of outlet that you feel drawn to from time to time? What's stopping you? Be intentional. Don't expect it to come together all at once. What would be a first step toward filling that void? P.S. I've got plenty of new listings to be added to Etsy in the weeks to come! listings, along with other art related information I find elsewhere. It's Time To Pack Art Supplies! 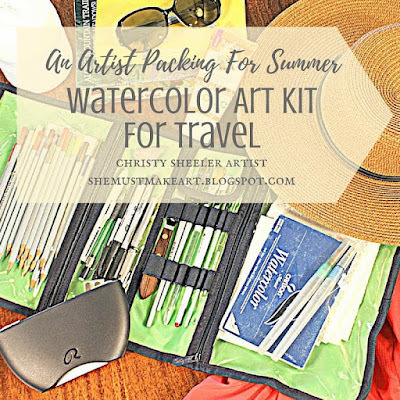 May is here, spring is in full swing, and it's high time to be packing that art bag. Is it time yet? I'm ready to take off for the mountains. There are trails to explore and campfires to build! My husband leans toward spontaneous more often than not. For anyone who knows us personally, you could say that's a huge understatement. I am the grown-up Girl Scout Brownie who has an addiction to preparedness. Well, aren't we a fine match?! I am very entertaining while hurriedly running around to pack up the essentials just before we head off on another day or weekend adventure. I've mentioned this before but here it is again. I have packed up a bag of art supplies every summer for nearly 20 years of our marriage. I used the art supplies more frequently before the busy summer days of motherhood. While I'm at the lake or in the mountains with our family, I feel like I need to be present...and sometimes I think they see photography or watercolor painting as bringing my work. It's work and pleasure all rolled into one. Photography is much easier to fit in with us constantly being on the move to somewhere else. I keep packing the art supplies because it's my habit. I'm sure one day the opportunity for a fast watercolor sketch will present itself! I continue to pack and carry this bag because one of these days, I'll be painting up a storm while I'm right there on location. Let's begin with the bare bones basics of art supplies for making some watercolor art in nature. This would be the list of most basic art supplies I pack to take on the road with me. With my love of art supplies, I have a difficult time with packing quite a bit more. (Yeah, you know me too well and you're probably saying, "no kidding.") The what ifs run through my brain and before I know it, half the studio is now packed in that bag. Laugh about it. I don't mind. It's all true. The watercolor palette is Royal Talens. It has its own travel brush. There are quite a few other nice travel watercolor palettes available. I prefer a mechanical pencil out of personal habit. It doesn't need sharpening. I just pack extra lead in the core. The watercolor sketch book features pages 5" x 7" in 140 lb. weight. This means there's some buckling from painting but not as much as a sketchbook meant for drawing. A powdered drink mix container was saved and cleaned for new use as a water container. Some artists use a collapsible cup and water bottle. Here, at higher altitudes, the sun exposure can really do a number on my skin. For the first half of the summer, too much time in the sun means I'm broken out in a rash. The Badger kids spf 30 sunscreen is scented with tangerine and vanilla. I cannot stand other sunscreens but this one is now my favorite! 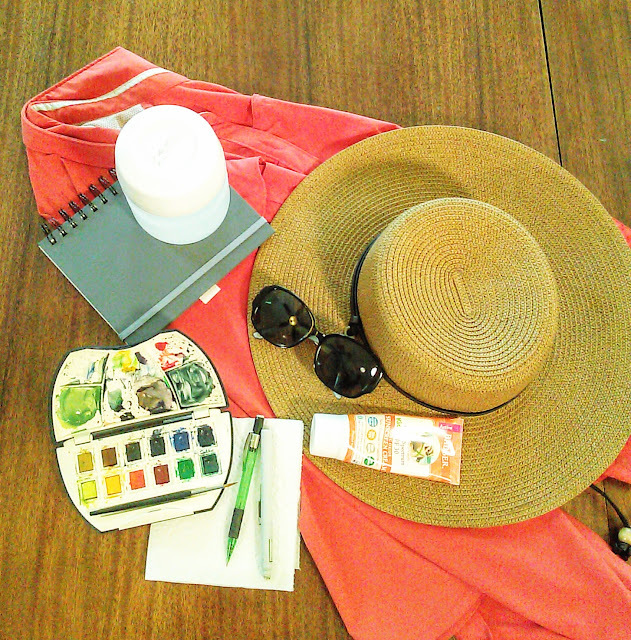 The wide-brimmed hat, sunscreen and lightweight shirt with built in sun protection are a must. I can't leave them at home. 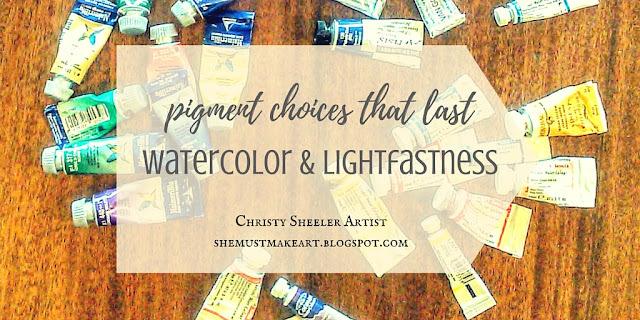 Watercolor pigment is a major player in this artistic adventure! 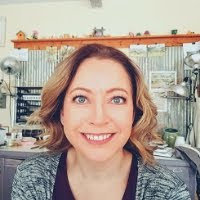 In the past week, I found myself exploring the Diane Sutherland Botanical Artist blog. Her work is just beautifully detailed. 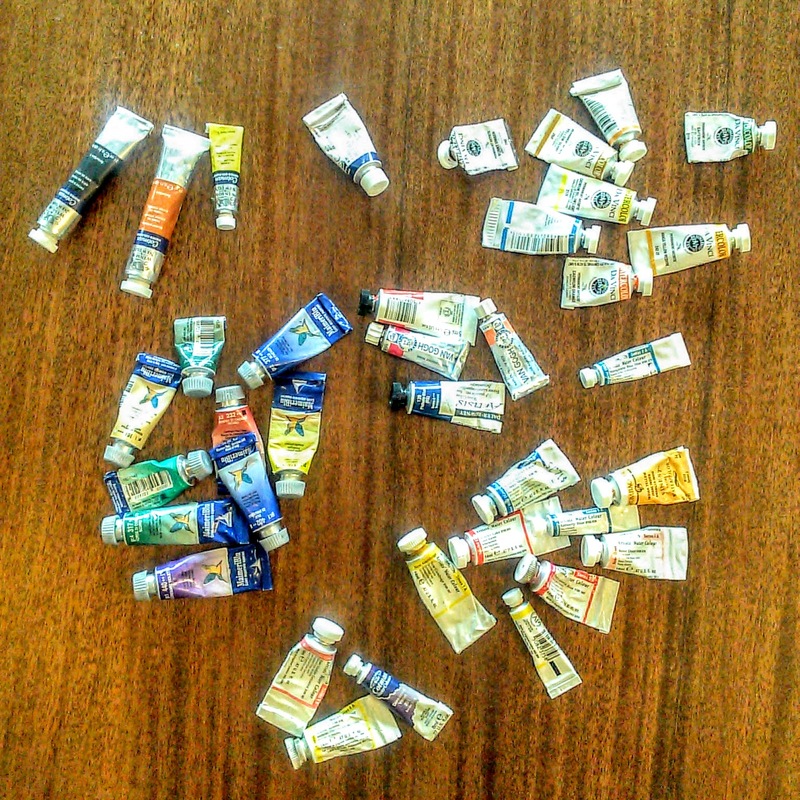 In her post, About Watercolor Paint, she talks about the pigment labeling and what it means. I was enjoying her post so much, picking up some great tips. Then I read what she shares about lightfastness. 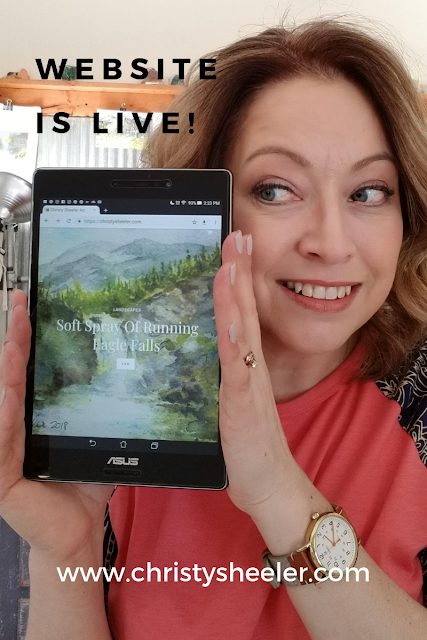 She gives links to other websites (I'll share at the end of this post) where test results are given for many watercolor pigments. I had to go dig deeper. Next thing I knew, I was sorting through my stash of watercolor tubes. This had me wondering about my own supply of paint! I can say I was not in a panic. This is not an emergency. It is information I'd like to understand. I want to be informed for future art supply purchases. I want to use this knowledge as I add to my pigment supply. Here's an artist's point of view on quality of materials. In the past year, I've been making a transition to all professional grade watercolor pigment. I was so frustrated with myself for realizing I'd recently purchased two more tubes of student grade watercolor pigment. That had not been my intention. Mistakes happen, I guess. I'm trying to make a commitment to all artist grade because it matters to me. In my research, I found I have three tubes in my supplies that are questionable for fading. Now, anyone who has artwork they wish to protect will most likely not hang it in direct sunlight. That makes sense, right? Watercolor artwork should be matted and framed behind glass and hung out of direct sunlight. It's still wise on my part to reconsider using pigments that may fade or change over time. The time spent choosing and mixing pigments, along with the time spent applying the individual layers of that painting...pigment choice matters. I invest so much of myself that it's worth making changes to which pigments are on my palette. I can't wait to share the news! I've got Giclee prints here now. They arrived a few days ago and now I'm preparing to list them on Etsy. If you live in our area, I'll have them in the studio for purchase. There's a bit more work to do before they'll be ready to leave the studio. I'll be signing, packaging and photographing them. The lilacs are blooming and I ought to grab my camera before they finish their show. It all changes so quickly! Our family will be heading closer to the mountains this weekend for an afternoon of picnicking, kayaking, and maybe even a campfire. I'll take my camera and maybe a few art supplies! Are you enjoying some time outdoors this weekend? Be sure to take some time to see what's happening in the nature around you! This was the ideal day for planting! With plenty of sunshine, I got outside just after 9 a.m. and began the garden work. It's more therapy than work. My aching back is now arguing that it still qualifies as work. Two raised beds, a planting guide in grid form, and a wide variety of seed packets were all ready to go! We began gardening this way in 2010 and it's an easy, low maintenance way to keep a garden. There are quite a few plants already doing well in the soil. I was pleased to see the beautiful red tulips. The bulbs have been there for many years, planted before we moved here in 2000. They are determined to come up and show their faces every year! The bunching green onions are from seed planted last year. Soon, they'll have blossoms and then seed. Last year, I tried the onion bulbs for $1.49/bag. I had no idea they could be so easy to grow! We enjoyed small onions all summer long. The Johnny Jump-Ups are popping up from where they self-sowed last year. There are several rogue mint plants. Though I transplanted the main mint plant to an herb bed last year, there continue to be a few more popping up in the garden bed.